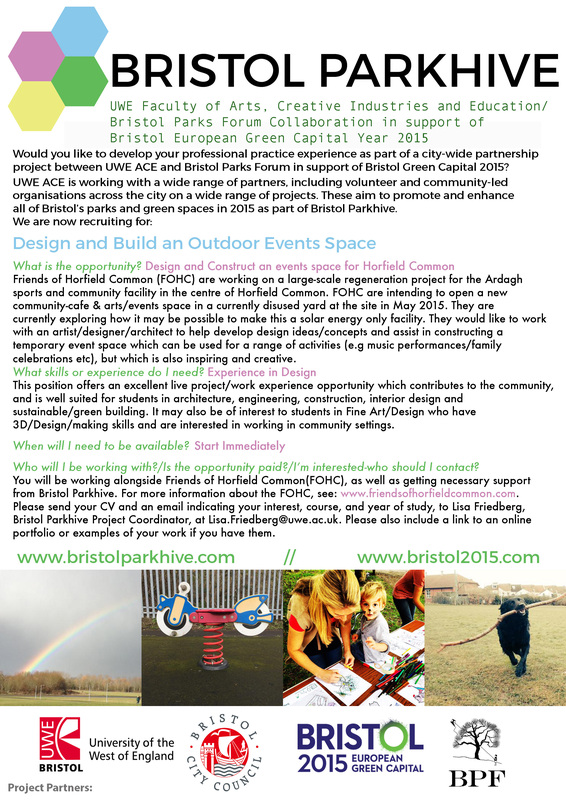 Friends of Horfield Common (FOHC) are working on a large-scale regeneration project for the Ardagh sports and community facility in the centre of Horfield Common. FOHC are intending to open a new community-cafe & arts/events space in a currently disused yard at the site in May 2015. They are currently exploring how it may be possible to make this a solar energy only facility. They would like to work with an artist/designer/architect to help develop design ideas/concepts and assist in constructing a temporary event space which can be used for a range of activities (e.g music performances/family celebrations etc), but which is also inspiring and creative. For more information about the FOHC, see: www.friendsofhorfieldcommon.com; for more details about the development of the project to date & community vision for it - see here. Suited for: This position offers an excellent live project/work experience opportunity which contributes to the community, and is well suited for students in architecture, engineering, construction, interior design and sustainable/green building. It may also be of interest to students in Fine Art/Design who have 3D/Design/making skills and are interested in working in community settings.